So, I'm terribly behind! I made this card for my Uncle's birthday, which was last week!!! And I still haven't got it in the mail yet! *hiding in the corner* Sometimes I am really bad about getting things in the mail. I had a lot of fun making this card. 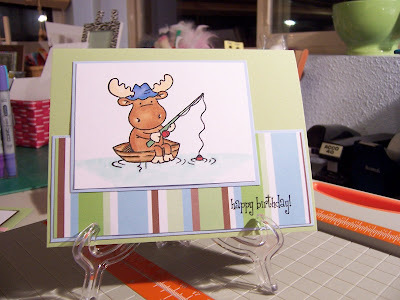 The image I received as a PIF (pay-it-forward) from one of my awesome PIFing friends over at Splitcoast Stampers. You can find the PIF thread here. It looks like we're in round 29 right now, the rounds can move pretty fast, but it's lots of fun! And a great way to get some stamped images. So, back to the card! I used the Riley Fishing image and colored him in using my Copic markers. I intentionally left the card simple. I have a hard time seeing masculine cards as being really busy or over-embellished. The card background is Certainly Celery. Layers are Bashful Blue and a patterned paper I found in a stack I got at Joann's. The birthday sentiment is from A Muse. Cute card! Great coloring job on it. So cute, Alana! I just love that Riley image and your coloring is fantastic! What a cute card. I love the moose. The colors are great as well! great card! Don't you just love those Riley stamps!